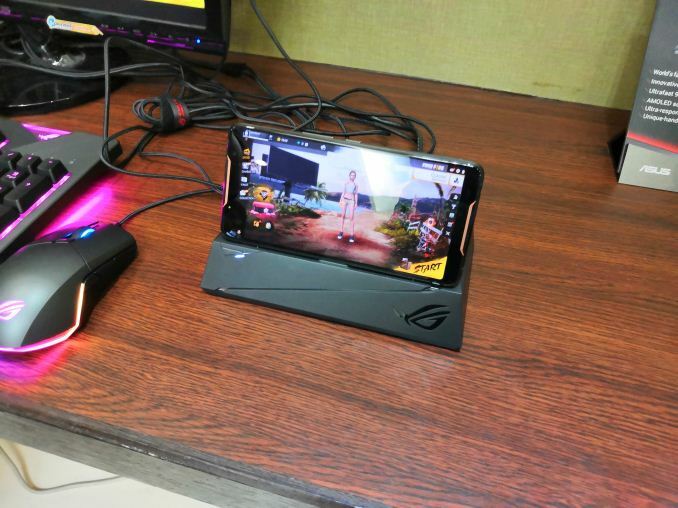 ASUS producing a gaming smartphone is one of the more esoteric news stories at the Computex 2018 trade show this year. To fire a shot right across the bow of Razer, ASUS is putting its ROG credentials on display: a speed-binned Snapdragon 845 running at a higher frequency than the standard S845 smartphones, a higher-than-standard 90 Hz refresh rate display with 1ms response time and 108% DCI-P3 gamut, programmable ultrasonic AirTrigger sensors, force feedback, and additional docks for purchase. One of the key elements is that ASUS built this phone with an 11mm thickness, well beyond the 7-8mm we see on flagship smartphones today. 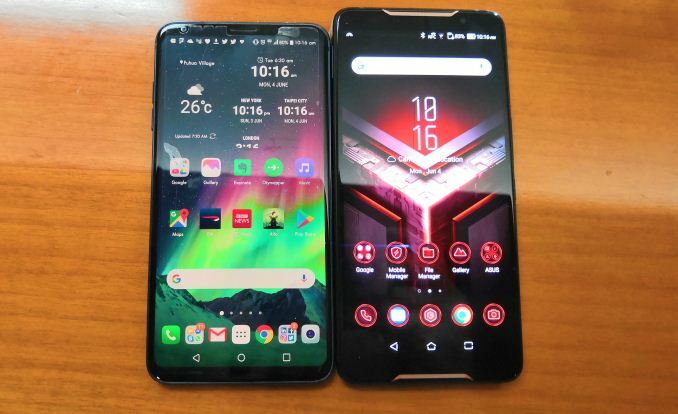 They have put that additional volume to incredible use for extra battery, more haptics, bigger speakers, more connectivity, and it’s a showcase of what we could see if other smartphone manufacturers offered a bit extra z-height. The 6-inch 2160×1080 AMOLED display is paired with the high-performance Snapdragon 845 SoC, 8GB DRAM, 128GB and 512GB of UFS 2.1 storage, along with a 4000 mAh battery, 20W ASUS Hyper Charge, support for 24-bit audio, and Corning Gorilla glass. One of ASUS’s key marketing points is the use of ASUS Aura RGB lighting, with the company stating that this is one of the first phones (if not the first) to fully exploit RGB in this way. For control, ASUS will be adding three ultrasonic air touch sensors – two shoulder triggers being the main ones. These are designed to be fully programmable and are more sensitive with haptic feedback. With the AeroActive cooler, which is bundled with the phone, aside from an additional fan to help cool the phone and sweaty fingers, it provides an extra USB Type-C connector which is side mounted for direct charging, HDMI output, Gigabit Ethernet, and headphones. 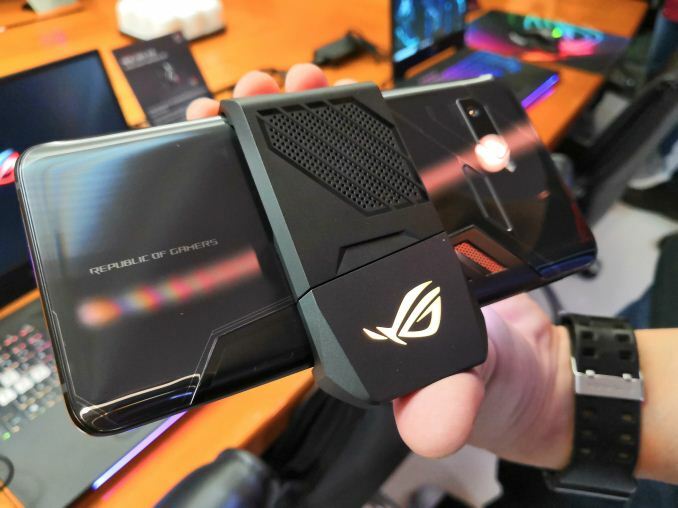 ASUS will be offering the ROG Phone with a series of accessories, including a TwinView Dock to convert the machine into a dual-screen hand-held console. The Dock also offers front-facing quad-speakers, two extra physical trigger buttons, better haptic feedback, an enhanced cooling system, and a 6000 mAh extended battery back. 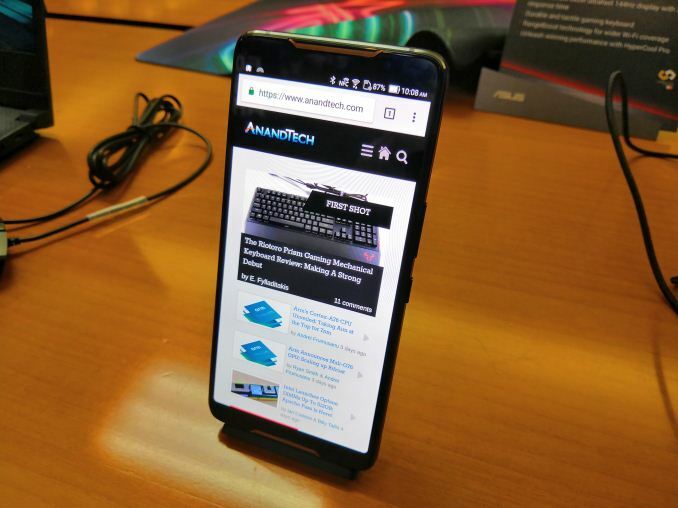 The Mobile Desktop Dock, another accessory, allows the phone to be connected to a 4K monitor, mouse, keyboard, and wired gigabit networking.